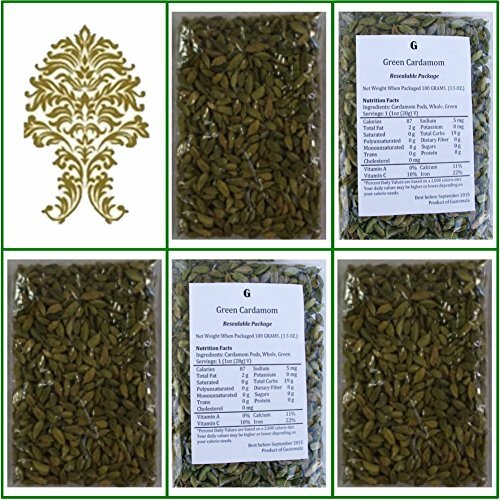 Natural Green Whole Cardamom Pods (elaichi, elachi, hal) - 17.6 Oz, 500g. (Qty. 5) 500g (17.6 Oz) sealable pouch of Super Jumbo natural green whole cardamom pods, extra fancy grade . Naturally grown in the hills of Guatemala. We ship within 3 business days. A member of the ginger family, cardamom is the fruit of a tall, perennial shrub that is native to southern India but also flourishes in tropical regions around the globe. Among the world's most precious spices, cardamom is prized for its intense aroma and warm, spicy sweetness. If you have any questions about this product by GaneshaSpice, contact us by completing and submitting the form below. If you are looking for a specif part number, please include it with your message.